Cable saw another bearish session on Wednesday plummeting 0.8% and adding to losses earlier in the week. 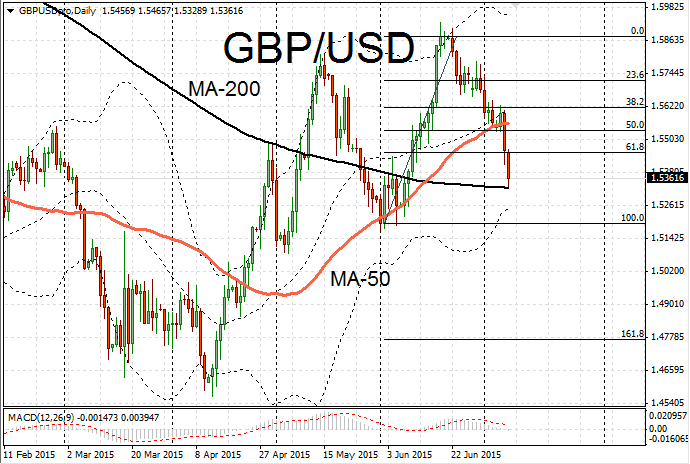 GBP/USD slid to 1.5324 where it received support on the 200-day moving average line. This also coincides with the 23.8% Fibonacci retracement level. 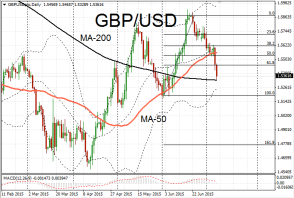 The strong rally in sterling had become overextended after cable touched an eight month high of 1.5928. With overbought levels at the top of their range there was certainly room for a correction and that appears to be unfolding now. The next support lies at 1.5206 and then lower and then at 1.5194. However given the depth of the retracement seen so far there is likely to be something of a rebound. The selloff was triggered as traders began positioning cautiously ahead of this week’s rate setting meeting by the monetary policy committee and the FOMC minutes. There was also a cautious reaction to today’s budget delivered by UK Chancellor George Osborne. Although forewarning of most of the major changes had already been announced. The budget had some positive elements for the economy and businesses but also posed challenges. Corporation tax will be cut to 18% by 2020. Working tax credits will be cut. This will place more of a burden on businesses to make up the shortfall with a higher minimum wage of £9. There was also a lifting of Sunday trading laws allowing shops to open longer. The chancellor also downgraded his growth forecast for the UK to 2.4% for 2015, in line with other forecasters. Sterling suffered major losses against the yen taking GBP/JPY down a two month low at 183.39. The latest move has erased more than half of the rally which began in April. The next support lies at 184.04 which coincides with the 200-day moving average. At tomorrow’s monetary policy committee meeting the forecast is for interest rates to remain at 0.5% and for the asset purchase facility at £375B.